The Flood Control and Water Conservation District covers all of Contra Costa County, including its cities, and owns property throughout the county for the purpose of constructing and maintaining regional flood control infrastructure. While the Flood Control District offers regional flood protection, it also provides technical information and education to cities and residents. Its operations are primarily funded through property taxes and developer fees. After World War II, the population of Contra Costa expanded dramatically. Due to this rapid growth, many homes and businesses were built in low lying areas susceptible to flooding. 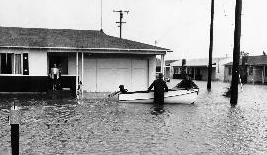 In 1951, as a result of prior widespread flooding, the Contra Costa County Flood Control and Water Conservation District was formed to provide flood protection. Over the past 59 years, the Flood Control District has completed many major flood control projects in Contra Costa County in order to make it a better and safer place to live. Today, the Flood Control District's mission has expanded to include stewardship of the environmental resources in the district-owned creeks. The Lower Walnut Creek Project is an important part of this mission. For more information, please view the Flood Control District's brochure.